What fields can I enter on a CenPOS mobile transaction? 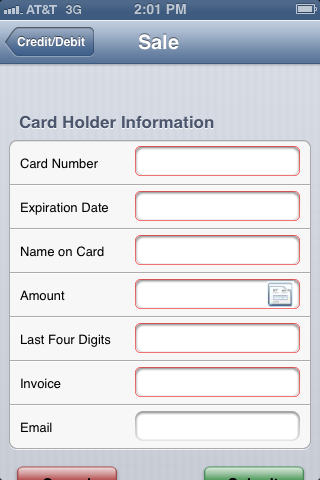 iPhone app credit card payments screenshots below are from the CenPOS retail app available for free download at iTunes. The two methods to use the retail app, do not include the restaurant and tip option, which are configured in the merchant set up. SCREENSHOT 1: RETAIL SWIPE. The standard screen is ready to capture data via magnetic card reader attached to the iPhone. The receipt can be emailed, or printed. SCREENSHOT 2-3: OPTIONAL ADDITIONAL ACCOUNTING DATA. Next to the amount field is a small graphical image. Because this merchant has optionally chosen to collect additional data about the sale, the icon can be pressed and the clerk can assign transaction amounts to different accounting codes. The accounting codes are used throughout different sources, such as the virtual terminal, or via an API. Merchants can use exsiting templates, such as the school/religious file, or provide one of their own to upload. Benefits include saving time assigning data later, as well as real time reporting to a remote location, such as multiple schools and churches reporting back to the archdiocese. SCREENSHOT 4: KEY ENTERED TRANSACTIONS. This images shows part of the different data captured when a transaction is key entered vs swiped. This is a key differentiator for CenPOS. Key entered transactions have a greater burden of proof for merchants to prove it was the cardholder making the transaction. Absent of magnetic stripe data, and based on merchant rules, CenPOS will automatically prompt for additional fields and send the transaction with the right information for qualified card not present interchange rates. The CenPOS works with your existing processor, and is fast, easy, and requires no capital investment to implement. Call 954-942-0483 or click here for more information. This entry was posted in CenPOS, knowledege base, mobile payments and tagged CenPOS, iphone app, mobile payments by Christine Speedy. Bookmark the permalink.